Western allies have implemented various measures in response to Russian aggression in recent years but without any significant impact on a hypothetical attitude change in Moscow. Amid Russia’s assertive policies, Western countries were confronted to a challenging situation: implementing an appropriate response to secure their interests around the world and, more importantly, doing so in a coordinated way. Increasing security cooperation among NATO allies in the age of rising nationalism has been and continues to be very difficult. However, from the Syrian Crisis to the Skripal poisoning, the West has implemented various measures to contain or punish Moscow for its attitude, with varying degrees of success. NATO allies engaged in Syria saw their range of action clearly limited with the UN blockage initiated by Russia and China, and even more so after Moscow decided to militarily intervene alongside pro-Assad forces in late 2015. 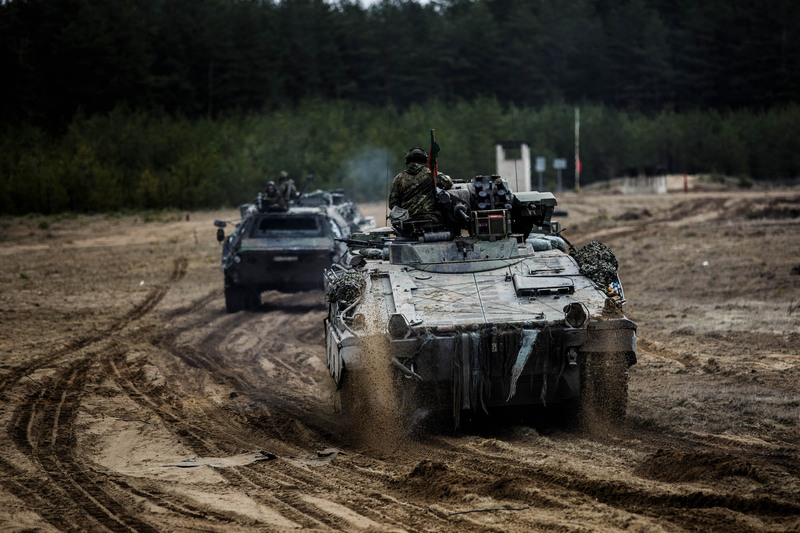 Amidst fears of a direct confrontation with Russian troops, NATO allies implemented a set of limited military options ranging from providing non-lethal aid to opposition groups, to conducting special operations on the ground. The US, Turkey, France and the UK were the four main protagonists of the Syrian Civil War on NATO’s side. The US has been, among NATO allies, the most active supporter of Syrian opposition groups. Washington provided selected armed groups (opposing the Assad regime), both in Syria and in neighboring countries (Jordan, Turkey, Saudi Arabia and Qatar), with training and logistical support. However, in the absence of an international mandate given by the UN and while Russia intervened with Assad’s blessing, the US ended up being an uninvited power interfering with Syria’s domestic affairs. The Obama administration was thus forced to shift the purpose of its military operations in Syria from counterbalancing Assad’s domestic policies to fighting terrorist groups in the region as part of the broader doctrine of the Global War on Terror (GWOT). In October 2014, the US’ Department of Defense established Operation Inherent Resolve “in order to formalize ongoing military actions against the rising threat posed by [the Islamic State – IS] in Iraq and Syria.” Refocusing military operations in Syria on counterterrorism implied cutting down support to these groups fighting the Assad regime, to the benefit of those committed to the fight against IS. This new policy came with serious consequences as the US lost many of its locally trained fighters who were “more focused on fighting the Syrian president, Bashar al-Assad.” In the meantime, the Assad regime backed by Russia was able to regain ground against Syrian rebels. Occasionally however, the US carried out military strikes against Syrian military positions as a response to the regime’s alleged use of chemical weapons. The US’ main partner in its fight against IS since 2014 has been the Kurdish People’s Protection Units (YPG). Although the YPG has proven to be the most reliable and effective group against IS, its empowerment at Turkey’s southern border raised important concerns in Ankara. Turkey launched Operation Olive Branch on 20 January 2018, targeting Kurdish groups in northern Syria in order to prevent the creation of an “autonomous Kurdish state that would challenge Turkey’s territorial integrity and national security” (although the operation was officially designated as a counterterrorist one). From then on, Ankara became more of a spoiler than a trustable NATO partner. Moreover, Turkey, who shot down a Russian warplane in 2015, has been nurturing closer ties with Moscow since then, hampering NATO’s efforts to appear as a united front against Russia’s actions in Syria and on the international scene more broadly. France and the UK have been involved in Syria to a lesser extent but also struggled to find a way around Russia’s leverage in the region. 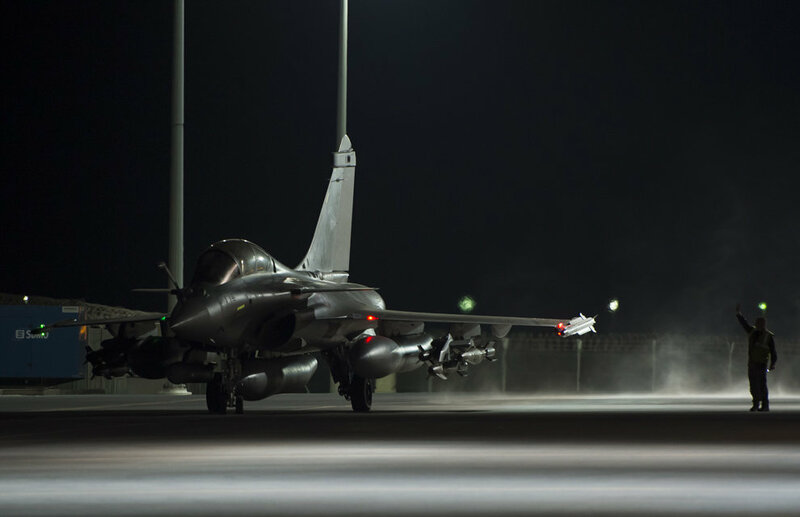 In September 2014 Operation Chammal and Operation Shader were launched, the French and British components of Operation Inherent Resolve, seeking to defeat IS in Syria and Iraq. Just like the US, France and the UK saw their original plan to push Bashar al-Assad out of power frustrated by the absence of international consensus and Russia’s support for the Syrian regime. 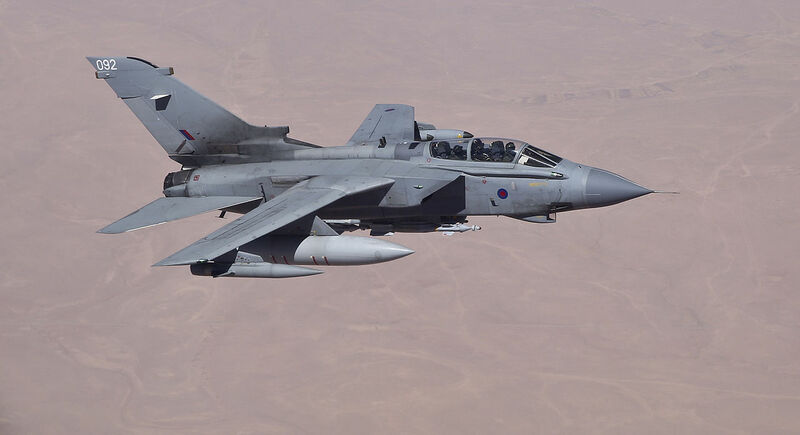 Paris and London carried out airstrikes in Syria against IS-designated targets. They also occasionally targeted governmental infrastructure following alleged chemical attacks and provided non-lethal assistance to some opposition groups, without Damascus’ approval and against Moscow’s will. However, the two European countries failed to implement a regime change in Syria, on the model of what they were able to do in Libya. In short, NATO allies have invested considerable resources in the Syrian Civil War but with limited impact on the conflict itself (with the exception of targeted strikes on terrorist groups), and remain unable to contain Russia’s strategy in the region. sanctions imposing an embargo on exports to Russia, of designated military and dual-use goods. 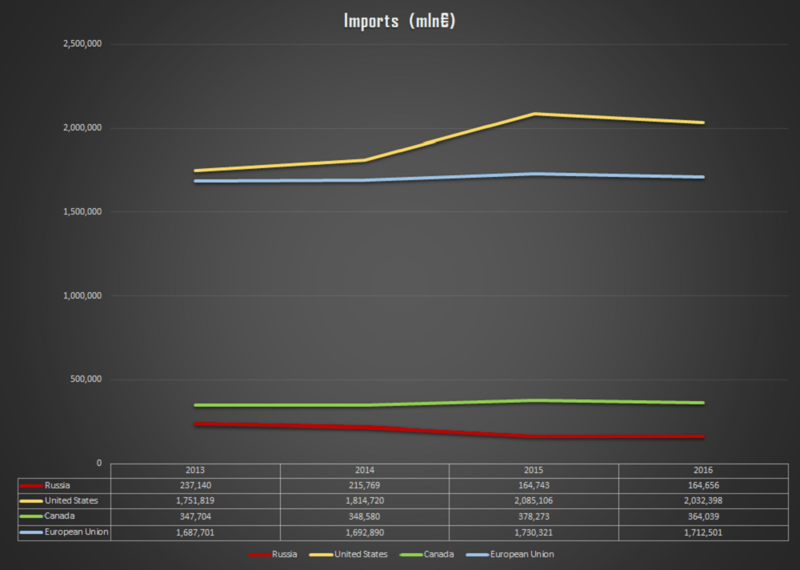 Early on, these sanctions, along with the depreciation of the global price of oil (a major source of Russian exports) affected the Russian financial sector, leading to the devaluation of the ruble by up to 40%, while $75bn worth of capital left Russia in 2014 (a much higher rate than the previous year). Russian oligarchs and many within Vladimir Putin’s inner circle were to be particularly targeted by US sanctions, with the hope of forcing the Russian president to comply with Western demands. 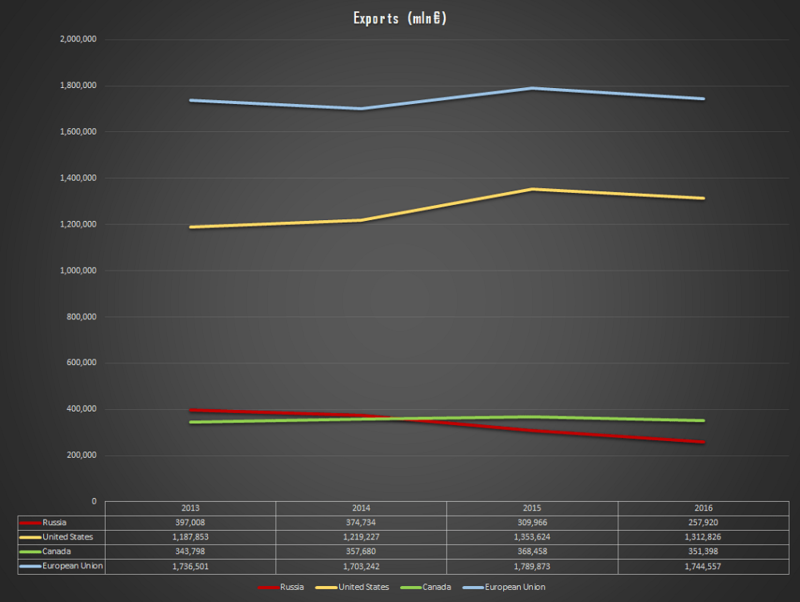 It is always difficult to evaluate the impact sanctions have on a country’s economy and it is even more complicated to determine whether they will translate into political gains (e.g. by forcing the targeted country to comply). 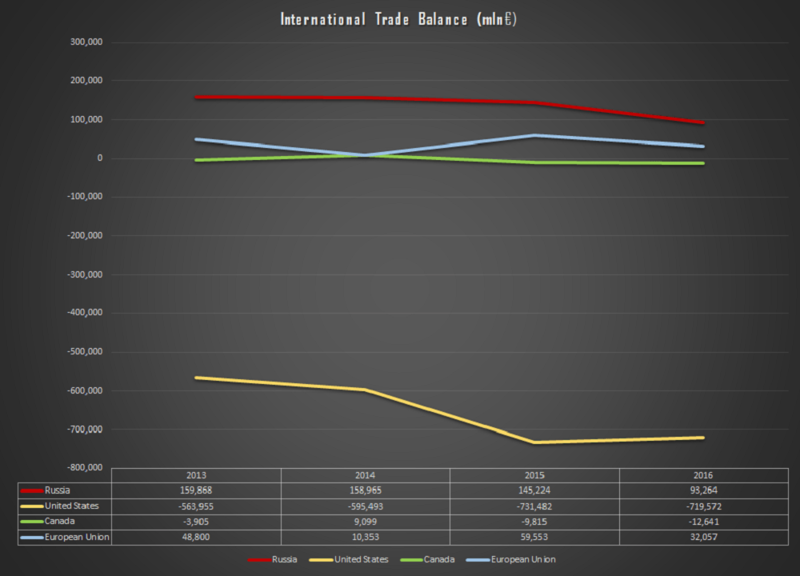 Western sanctions seem to have impacted the Russian economy at least to some extent, affecting the country’s imports, exports and share in international trade. However, these sanctions did not lead to an attitude change in Moscow thus far and every day that passes makes the perspective of Russia complying less likely. According to Andrey Movchan, director of the Economic Policy Program at Carnegie Moscow Center, Western sanctions have not worked as much as people would like to believe. 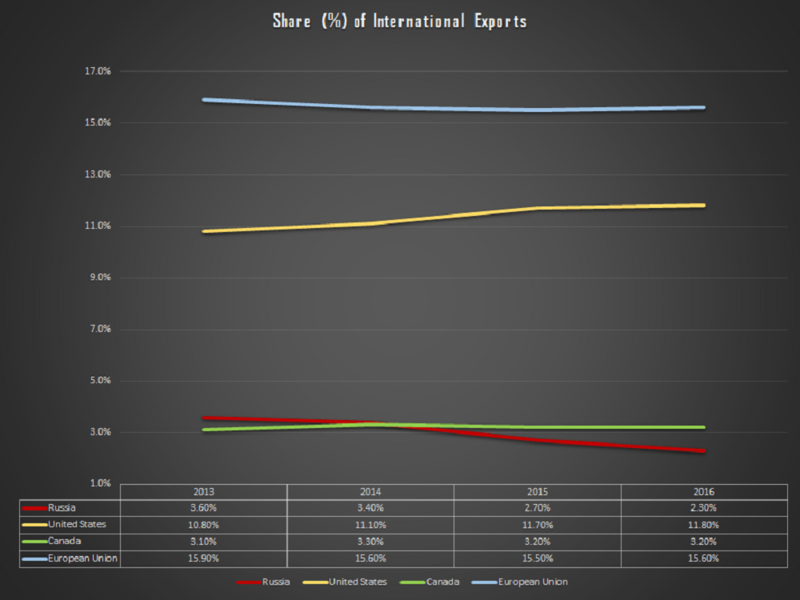 First, he evaluates that “more than 30% of [the Russian budget] is classified as secret,” hence falling out of accurate international estimates regarding Moscow’s (and Russian oligarchs’ in particular) economic resources. Movchan argues that “both the government and businesses had accumulated cash reserves from the oil boom” (which lasted for roughly a decade between the late ‘90s and 2008), allowing them to amass gold and foreign currency reserves among other assets. In addition, he explains that despite the state controlling most businesses, “Russia still enjoys the benefits of liberal economics” including unrestricted cross-border capital flows and the possibility to align with international markets in order to stabilize the ruble’s exchange rate in the free market. In short, it will take much more than the current sanctions to destabilize Russia and Vladimir Putin, while they have also been costly for Western economies. NATO’s Enhanced Forward Presence, although a defensive mechanism, can be seen as the alliance’s first proactive move against Russia since a neo Cold War started to take shape. NATO emphasizes the deterrence purpose of the operation while its transcontinental dimension (troops come from Europe and North America) is meant to be “a tangible reminder that an attack on one [NATO member] is an attack on all.” In addition, NATO Enhanced Forward Presence includes frequent military exercises seeking to ensure the operational readiness of the troops involved. As of 1 February 2018, more than 4,500 troops were mobilized in all four battlegroups. 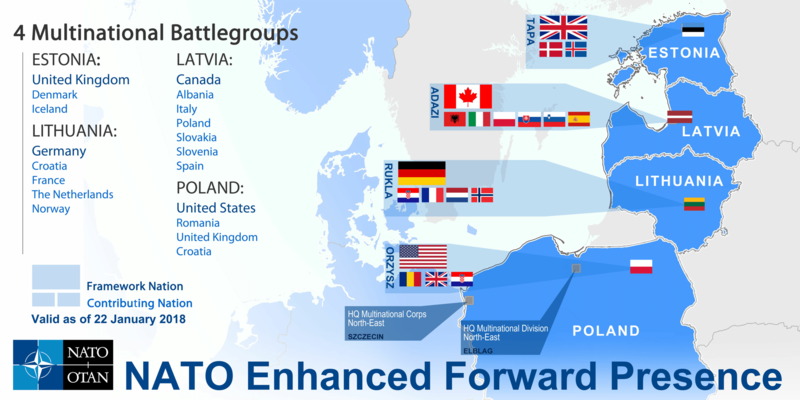 NATO Enhanced Forward Presence brings a new dimension to the modern opposition between the West and Russia as it brings an important military presence at Russia’s doorstep and around the Russian enclave of Kaliningrad. It prevents Russian incursions into Eastern European territories outside the unlikely scenario of a direct military confrontation and allows for a better monitoring of Russian military activities in the Baltic Sea and around the region more broadly. Moreover, at a difficult time in terms of unity among NATO members, the operation creates bounds and opens new perspectives for military cooperation, especially since European Defense is evolving at a slow pace. Alongside economic sanctions and military operations, Western countries have implemented a set of diplomatic sanctions following Russia’s meddling in other countries’ domestic affairs. Barack Obama set the tone in December 2017 when he decided to expel 35 Russian diplomats and close two compounds used for intelligence-gathering in the US following Moscow’s involvment in the American presidential election. 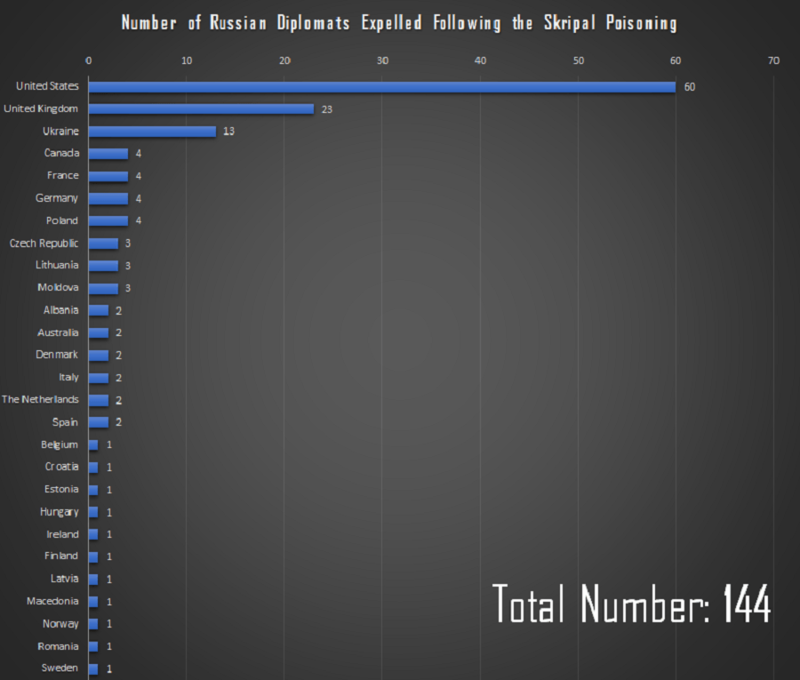 The expulsion of Russian diplomats intensified in March 2018 after the poisoning of former Russian double-agent Sergei Skripal and his daughter. At least 27 countries expelled 144 Russian diplomats in solidarity with the UK, while NATO decided to remove seven staff from its Russian mission. These diplomatic sanctions symbolize the worsening relationship between Russia and the West but also outline the creation of a – though fragile – united front against Russian interference in European and North American domestic affairs. Indeed, countries like Hungary and Italy, usually pursuing Russia-friendly policies, were among those implementing the diplomatic sanctions. Similarly, Russian state-media are now targeted because of the influence they try to exert on Western societies. French president Emmanuel Macron decided for instance to deny access to RT and Sputnik at political conferences, calling them “agents of [Russian] influence and propaganda.” However, for analysts such as Jakub Janda, from the Prague-based European Values Think-Tank, these measures are not sufficient and the West should be tougher on the Kremlin. Western countries should, for instance, step up its economic sanctions while implementing new legal frameworks to counter Russian interference and propaganda, as well as more efficiently prosecuting these agencies and individuals illegally operating for Moscow abroad. 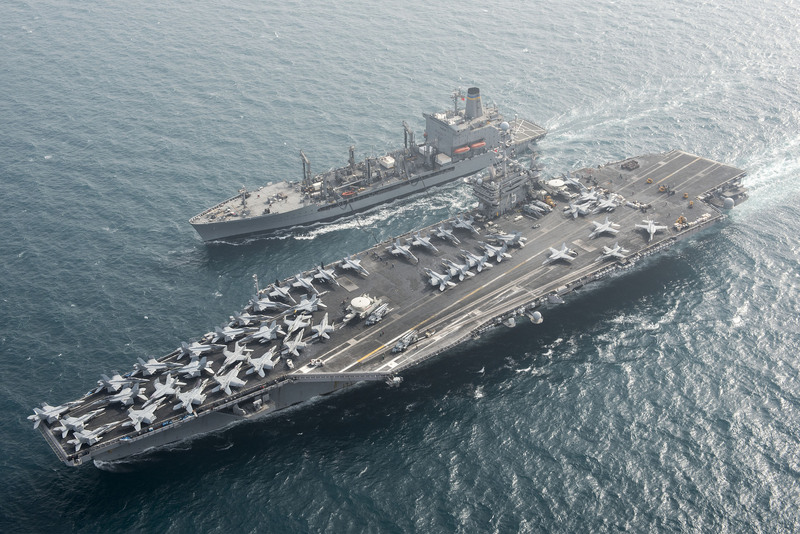 To summarize, the Western response to Moscow’s assertive attitude was late to develop. After the unsuccessful Syria policy and the failure to protect Ukraine’s territorial integrity, the West organized to counter Russia in 2014 with a set of economic sanctions. 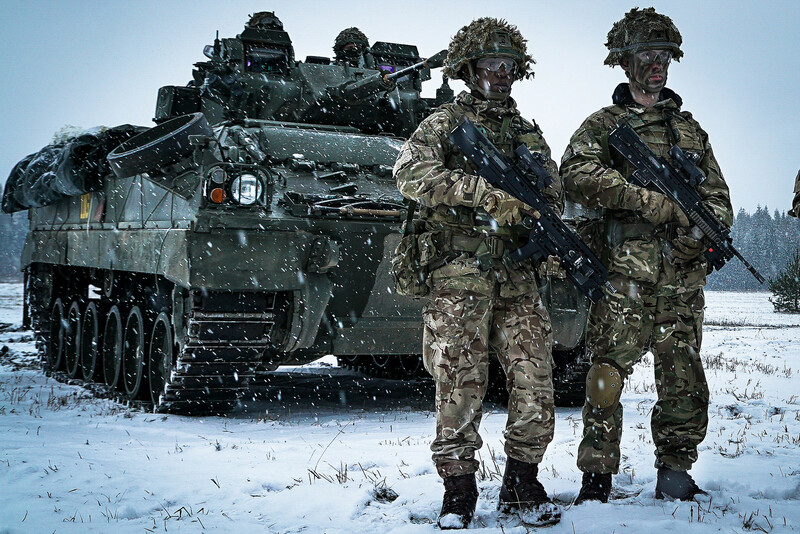 More recently, NATO members and their allies have been more proactive in responding to and preparing for Russian aggressions by organizing military operations around the Russian border, implementing diplomatic sanctions and countering Russian propaganda. However, these measures are yet to lead to an attitude change from Vladimir Putin and have done less in containing the Russian strategy than reaffirming Cold War-like tensions, an exercise that the Russian president has long been preparing for. Part 5 of our series focuses on Vladimir Putin, his domestic strategy and the perspectives of a neo Cold War.